Description: Send your Custom Message or Direct Message to your New Twitter Follower and View your Twitter Statistics to Grow your Audience. Have you a Twitter account? Do you want to send a thank you message to all of Twitter users who recently follow you? We are all know that Twitter is a great marketing tool so we should not avoid using Twitter when we talk about online marketing, drive traffic or news distribution. A welcome message can impress your followers and it may help them to stay in touch with you, once you introduce yourself, your blog or your services. 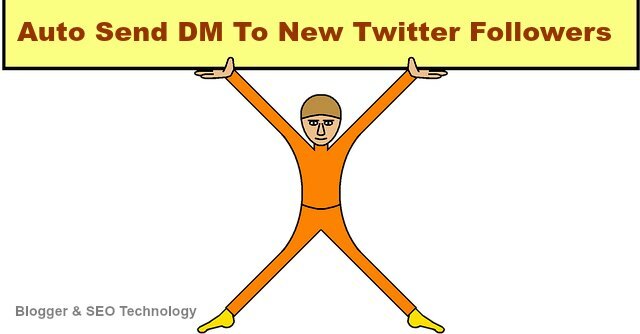 Twitter direct messages have no restriction on character limit as a tweet has, therefore you can express yourself in better way to your new followers. As we all know that the first impression is the last impression to like or dislike anything. 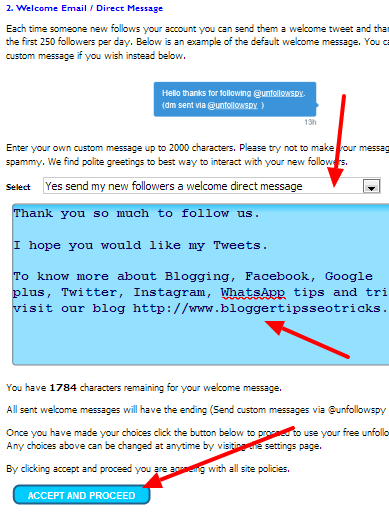 Create your direct messages in such a way that look like to good to keep your followers always stay in touch with you. You can also auto post your Facebook status update to your Twitter account and Auto Send Tweets to your Facebook Fan Pages. There are many tools exist on the web that send the direct message to new followers automatically, but here I am listed a best Twitter marketing tool that not only help you to send automatically direct message to your new followers it also helps you to find the following things for your Twitter account for free. Click on "Sign in with Twitter" and click again on "Authorize App". Now, a new user setup account page will open. Scroll down the page and look at the 2 point "Welcome Email / Direct Message" under Please make your selections. As mention in the following screenshot select "Yes send my new followers a welcome direct message" by choosing drop-down menu. Write your message or your introduction with your services or blog link. Finally, click on "ACCEPT AND PROCEED"
Now you will see your account page where you can view your Twitter stats by using the right menu. For more Twitter tricks update follow us.